Moxibustion is the burning of cones made from the processed fine leaves of the Mugwort plant on Acupuncture points, or on broad areas of the body to achieve specific healing effects. Moxabustion is warm, and as heat is an energy source, it is a way to add energy to the acupuncture channel, whereas the needle therapy unblocks stagnation of energy. 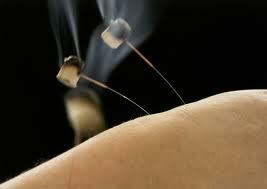 As such, moxabustion is considered strengthening to the body, and can be used for conditions of weakness and cold .